Yamamoto ultra-large hydraulic rock splitters are specifically designed for the mechanical excavation of large volumes of hard rock. Using explosives or large rock breakers are the normal methods for the excavation of hard rock. But restrictions on blasting are getting stricter and the use of rock breakers is not always feasible due to vibrations, noise restrictions or simply the rock being too hard to break. Yamamoto ultra-large rock splitters offer an alternative method for efficient excavation of large volumes of hard rock without the need for explosives, vibrations or fly rock. There is no upper limit to the hardness of rock but the splitter is typically used when the rock is too hard for normal rock breakers. For large volumes of rock there is simply no mechanical method more efficient, safe and quiet than the Yamamoto rock splitter. Rock splitting is done without any explosives, pollution or noise. Therefore it is possible to work in an environment where there are restrictions for such issues. Also it offers a safe working environment. Yamamoto splitters offer you the highest possible productivity due to a very high splitting force and high durability and reliability of its wedges. Yamamoto rock splitters work in minimum working area and can be adopted in many different types of working conditions. Rock splitting offers more accuracy than explosives because the direction of splitting is extremely easy to control. Splitting does not produce fly rock and lets you control the splitting direction easily. Also there is no need for temporal evacuations that result in unnecessary pauses in the operations and labor cost loss. Yamamoto splitters are very simple and easy to use and there is no need for highly experienced operators. Yamamoto rock splitters can be attached to almost any kind of hydraulic excavator from 12 ton and up. For vertical applications (shaft-sinking, open pit excavation, road widening, etc. ), the rock splitter is mounted on a wire from a conventional excavator of 12-ton class or larger, normally a 20 ton excavator. The hydraulic power of the excavator is sufficient to power the rock splitter. If the space is limited the splitter can be mounted from a crane and powered by an external power pack. The splitter can also be mounted with a wire and hang on the side for small volumes of rock like trimming along perimeter or demolition of diaphragm walls. 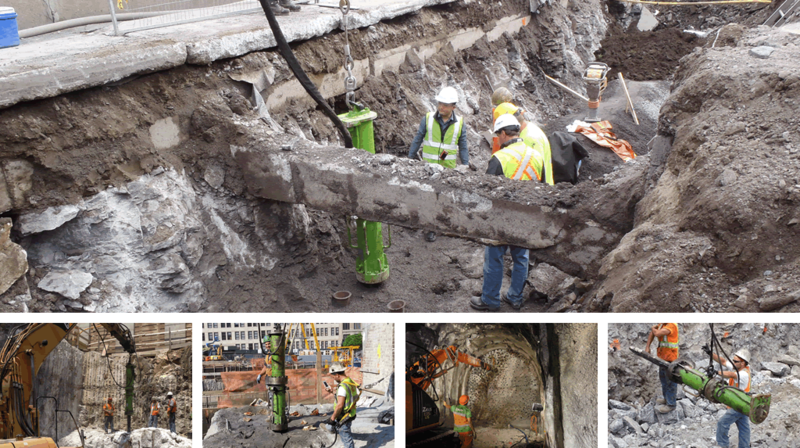 For tunneling and other horizontal applications with larger volumes of rock, the splitter is mounted on a specialized carrier with telescopic boom and rotator.